Yesterday we took a visit from an out-of-town friend as an excuse to visit two iconic sites located in as close to our own backyard as you can get in the city. On a hazy September day, we joined a ferry-load of Mid-Western and East-Asian tourists on a circle through New York Harbor to Ellis Island and Liberty Island. We left from Liberty State Park in Jersey City. Since I hadn't been on this particular route since I was in elementary school and summer camp, I couldn't recall from where we departed those 12-18 years ago, but I would recommend Liberty State Park as the port of choice to anyone. Ellis Island has benefited from exhibit renovations and excellent scholarly work since I last visited it in the 90s. Highlights included the shipping records on lecterns in the mostly empty Great Hall (see photograph), the historic exhibits in the main building's west wing balancing artifacts, photographs, text and oral history excerpts, and the exhibit of photographs of the abandoned buildings of the complex taken between 1954 and the 1984 restoration. 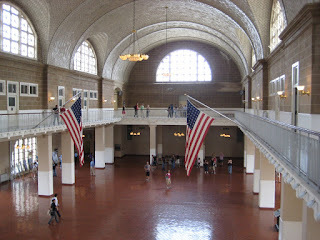 Ellis Island offers an excellent all-around historical experience. We began our visit with an introductory play that was, despite the cliche, both entertaining and informative. We were then free to browse the exhibits, interact with kiosks containing links to census maps and immigrant databases, spend reflective time in un-crowded architectural spaces and listen to oral history excerpts. Exhibits were appropriately stand-alone but linked well together to form a coherent visitor experience. 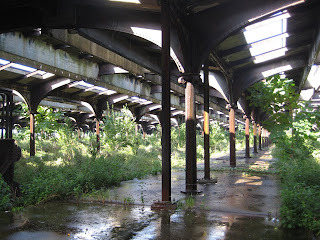 Ellis Island struck the right balance between interpretation and freedom for imagination. We ended our visit by riding the ferry to Liberty Island and then back to Liberty State Park. These days with tightened security procedures, the Statue of Liberty offers a much truncated visitor experience. More could be learned by viewing the statue from the deck of the ferry and imagining what it would have felt like to see it after at 6-week trip from Poland in steerage. Watching the other visitors experience the "historic triangle," I felt a renewal of my faith in the power of public history.